Helsinki is known for historic sites, museums, shopping, fun & games, and nightlife. 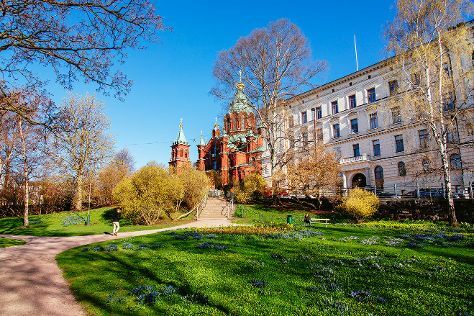 Your plan includes some of its best attractions: wander the streets of Katajanokka, pause for some serene contemplation at Helsinki Cathedral, relax and rejuvenate at some of the top local wellness centers, and play a few rounds at Tapiola Golf. To find where to stay, more things to do, other places to visit, and tourist information, use the Helsinki trip planner. If you are flying in from United Kingdom, the closest major airport is Helsinki Vantaa Airport. In April, plan for daily highs up to 9°C, and evening lows to 0°C. Wrap up your sightseeing on the 20th (Sat) to allow time to travel back home.